Talking points email wouldn’t deal with the disaster enough. 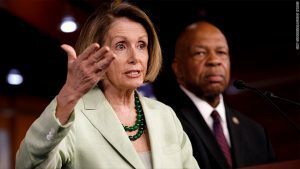 House Democratic leaders have scheduled a Saturday afternoon conference call with the full caucus to discuss the party’s early strategy following the conclusion of special counsel Robert Mueller’s marathon investigation into Russia’s election interference. The 3 p.m. call will be led by Speaker Nancy Pelosi (D-Calif.), Democratic Caucus Chairman Hakeem Jeffries (N.Y.) and members of the committees with jurisdiction over the issue, according to several Democratic aides. Beyond Pelosi and Jeffries, four other lawmakers will speak on the call, an aide said. Rep. Jerrold Nadler (D-N.Y.), chairman of the Judiciary Committee, and Rep. Adam Schiff (D-Calif.), who heads the Intelligence Committee, both have jurisdiction and are likely to speak. A small but restive group of Democrats has been clamoring for the party to use its newly won House majority to launch impeachment proceedings against President Trump — a process Pelosi and her leadership team have firmly rejected, citing the need to build bipartisan support and to see the results of Mueller’s report.